Ring of Honor has re-signed recent TV champion Adam Cole to a new contract, the promotion announced Thursday night. Cole was recently on WWE's radar, but WWE reportedly passed on Cole following a try-out camp. 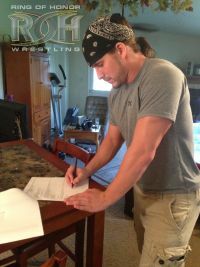 In the announcement Thursday, ROH included a photo of Cole signing the contract and a statement from Cole on continuing to wrestle for ROH. "Re-signing with Ring of Honor is exciting for me on many levels. Getting to continue my journey in the best wrestling company in the world has my motivation and drive at an all time high. If you want to be the best, you prove it in Ring of Honor. And that's exactly what I plan on doing," said Cole.